Jain Logic - Weather Monitoring, Water Level Monitoring, Flow and Pressure Monitoring, Pump Monitoring and Control. In 2017 Observant was acquired by Jain Irrigation, Inc, read all about it here. Ben McDonald, a second-generation farmer, was only three years of age when his “old fella” purchased his first farming property back in 1984. In 2000, just northeast of Charleville in Mantuan Downs, Ben brought back into the family’s Albeni farming property, raising over 9,500 *Organic Certified Beef Cattle whilst retaining country in Rolleston and Blackall. When farming cattle, water is the key to livestock health and growth making it a priority to have access to fresh water supplies 24/7. To secure stock water supply, Ben monitors water from start to finish, investing in flow meters on pipes, a pressure transducer setup on a pump and an ultrasonic tank level sensor which has been set up to send him both low and high water level alerts via text message. Ben logs in via his smartphone to manage his system using Jain Logic software, checking each of his water points remotely, setting up alert thresholds and remotely controlling his pump’s start/stop cycle. By combining Jain Logic’s monitoring and control solutions, he can then tell a story as to where water is flowing. If there is ever an issue in his system setup, such as a leak in the pipes or the tank, engine failure or pump error, Ben is notified via text message alerts. Albeni site, water flow readings on Jain Logic software. Monitoring the health of his system and receiving time-critical alerts is essential, as it gives Ben time to resolve the problem before his cattle are alerted to it and stress out. Ben explains that stressed cattle lose weight quickly, as they don’t eat or drink and stressed animals can set a farmer back weeks in the cattle growth productivity affecting the bottom line. When asked how do you know when cattle are stressed? 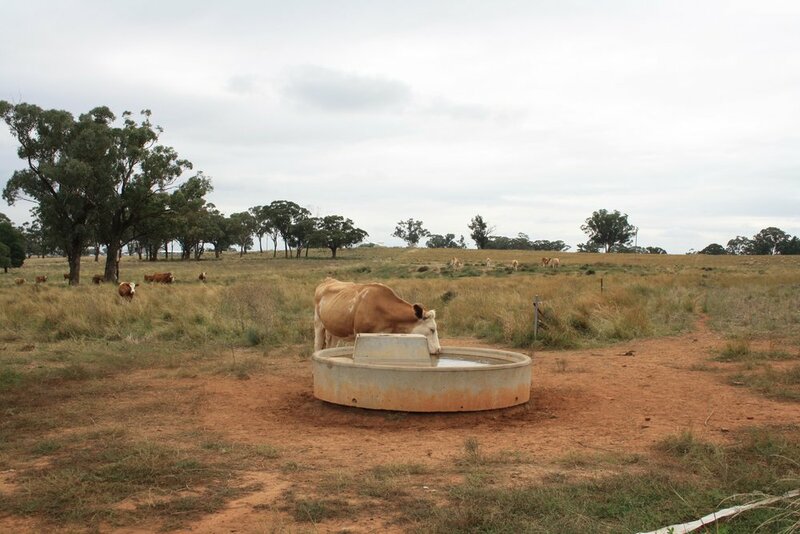 Ben explained that cattle are no different to humans, they’ll push out of paddocks, they’ll get upset, they’ll start panicking if water is going down and they think they’re not going to get a drink, and 9 times out of 10 cattle have caused the damage. Using Jain Logic software to manage water and narrow down system failures to the source, Ben uses the water level trends seen under historical data for his tanks by logging into Jain Logic via his smartphone. The data paints a picture around what’s been happening with water, especially in the last 7 days, which he can then pinpoint down to thirsty cattle or a problem with his system. Alerts and the graphs help Ben decide if cattle water consumption has increased or alert him to any issues with the pipes, pump or tanks. Ben goes on to say that Jain Logic streamlines everything, 5 minutes in the morning on Jain Logic and you know if there’s a water problem and exactly where it is. This gives us peace of mind and the system allows us to get on with other work on the property. We’re able to see major cost savings in the farm’s infrastructure and water storage through Jain Logic alerts and automation, making us more efficient. Account for faults in your system, they’re bound to happen. Stay prepared with alert notifications and monitoring key water points. The story of water — a complete picture. Compliment water level sensors with flow meters and pressure transducers to monitor water from the source. Set alerts on your key water points to protect your stock and save on labor costs. * Organic Certified Beef Cattle, no insecticides, pesticides. grass fed cattle.